Mega-club LAX has made this a top party hotel in Vegas. These Vegas hotels have the best day-time party scenes in Sin City. We are big fans of day drinking and making fools of ourselves in the sunlight. Thankfully for us, there are plenty Las Vegas party hotels with wild day-time party scenes. It's always good to add the excitement of possible death by drowning to the mix while partying it up at one of the party hotels Vegas. 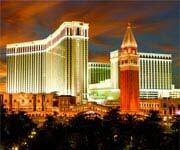 Venetian Hotel and Resort: Tao Beach at The Venetian is a great place to see lots of skin in Vegas. Bikini clad hotties roam around this big-time Vegas pool party and the great thing is, you never have to leave. Tao Beach is literally on-top of uber popular club Tao at The Venetian making this hotel one of the best party hotels Las Vegas. MGM Grand: Wet Republic is in the running to be the top pool party in Las Vegas. The MGM Grand hosts this incredible pool party with two salt pools and a 53,000-square-foot party packed area. If the three hour wait doesn't tell you this is one of the hot party hotels in Vegas, maybe the celebrity guest list will. Hard Rock Hotel and Casino: Pool party Rehab is unleashed every weekend at Hard Rock Hotel and Casino. This is the wildest pool party around and a must for you crazy party monkeys out there. This is where the beautiful people come to party so indulge in some major poolside eye candy at this Las Vegas party hotel. A top party hotel in Vegas that combines wild parties and high-class luxury. These party hotels put your local watering holes to shame. For all you night-owls out there, there are quite a few awesome party hotels in Las Vegas with all-night rage fest venues. From the house pumping mega-club scene to intimate lounges with live music and fancy cocktails, Las Vegas party hotels have every kind of nightlife imaginable. After all, it is the entertainment capital of the world. Caesars Palace: Home to club Pure, this Vegas Strip hotel is a top party hotel in Vegas. Pure is the epitome of Vegas nightclubs with 36,000-square-feet of party space, three different venues in one, and an incredible view of the Las Vegas Strip. Caesars Palace puts guests up in style and gives them the best nightclub without even leaving the building. 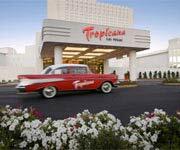 The Palms: This classic Vegas hotel has two of the hottest nightlife destinations in Vegas. Ghostbar is a classy rooftop lounge with trendy and attractive patrons looking for a good time. Mega-club Rain is the hottest fantasy dance club on the Strip with live entertainment, famous DJs, and a HUGE dance floor. The Luxor: Vegas mega-club LAX has become one of the most talked about clubs in the country. A state of the art sound system and two stories of red leather and chandeliers makes this hot Vegas club an absolute necessity for a wild night out. 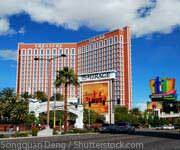 Las Vegas party hotels have helped to shape Sin City as one of the top party destinations in the world, and there are a TON of great Las Vegas party hotels to choose from. The infamous Vegas Strip houses some of the all time best party hotels in Vegas but there are also some really fun Las Vegas party hotels located Off-Strip. The party never stops in this wild town so hotels have focused their energy on making their hotel the number one party spot in Vegas, and our collection of Las Vegas coupons make staying at these Vegas party hotels cheaper and more convenient than ever. Time to pop bottles, Cheapos! We don't stop partying in Vegas just because the sun came up. It's a 24-hour party marathon out here in Sin City and there are plenty of party hotels in Vegas who capitalize on this. The big fad is huge poolside club scenes which we think is amazing. After a few drinks, walking becomes pretty difficult so instead you can just float around (hopefully face up) in the pool and lounge away your buzz. Sounds like heaven to us. The nightlife at the party hotels Las Vegas has something for everyone from Las Vegas mega-clubs to intimate little lounges, these hotels know how to do the night up right. Get ready to drop some cash because Vegas clubs are not known for being cheap but there is no better place to party than Sin City. Party hotels in Las Vegas can range from elegant 5-star hotels and resorts on the Vegas Strip to low-key Off-Strip hotels. The best party hotels in Vegas cater to every kind of Vegas party animal and give guests tons of variety when it comes to their stay in Vegas.